Nithu's Kitchen : Tell us about you Rachana. Rachana : I was born in Rajasthan, India, brought up in Kolkata, India and am presently living in Munich, Germany with my husband. I am the eldest of the 3 siblings and am very close to both my brother and sister. I am a Commerce graduate and also studied Fashion Designing and worked for a year before marriage. I am a homemaker now and do some voluntary work. 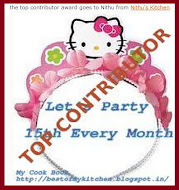 Nithu's Kitchen : What does your blog focus. 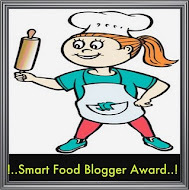 Rachana : I am a vegetarian - and so is my blog, as you can make out from the name! In addition, I often try to do healthier versions of traditional recipes. Rachana : I took to cooking late, but then with a passion. 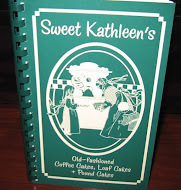 My mother was (and still is) a big supporter of letting us find things out by ourselves - so she never gave us detailed recipes - while this made life slightly difficult sometimes, it also woke a sense of and love for experimenting and figuring stuff out - something that helps me no end now, when I am thinking up recipes for my blog. Nithu's Kitchen : Share us one unforgettable cooking experience. Rachana : One such incident, which I will never forget... After shifting fro Kolkata to Munich, I wanted to make a kadhi for the first time. 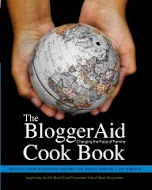 I knew roughly how it was made, but didn't know the ratio of the gramflour to the buttermilk. I called up my mom and asked her the ratio, she didn't tell me the ratio purposely and said, "I should figure it out myself". After giving it a little thought, I tried something out, and the kadhi turned out to be really good. After a few hours, my mom called up to inquire about the kadhi and explained why she didn't tell me anything about the recipe. I guess, that made me. Rachana : Today's Chyawanprash dish is one I have seen my mom making often, but never got from her the exact recipe and measurements. And it also turned out to be pretty good! Put the gooseberries in a pressure cooker. Add enough water to cover the gooseberries and pressure cook them for 4 whistles/ring or until the gooseberries are soft. Drain the water and remove the seeds from the gooseberries. With a mixer, puree the cooked gooseberries. Add the pureed gooseberries in a large cooking vessel and add the sugar to it. Place the vessel on a medium heat and bring the mixture to a boil under constant stirring. When the sugar melts, add the spices and mix well. Cover the vessel and reduce the heat to low and let the mixture cook for 5-7 minutes, stirring occasionally. Be careful, the mixture splutters a lot!!! When the mixture thickens a little, do a saucer test, (as you would when making jams). If not ok, then bring the mixture to a boil and check again. Fill the conserve/jam in a sterlised jar. Cover the lid when the jam is completely cool. Shelf life of this jam is 2-3 months. Nithu's Kitchen : Thank you so much Rachana. We enjoyed talking to you. Glad to know more about Rachana, love her space, that gooseberry jam tempts me alot. Glad to know more abt u dear.. beautiful post and recipe. Great guest post, Nithu..It was really nice knowing about Rachana..Thanks to Rachana for sharing the recipe for this healthy and tasty chyavanaprash..Fabulous pic! good to know Rachna..shal surely hop on to her space and chk it out! awesome recipe..! have bookmarked it.. love to follow u.. 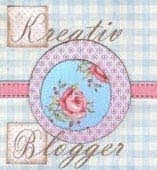 There is a small giveaway in my blog.. Do participate in it! Great guest post, Nithu..It was really nice knowing about Rachana..nice recipe..
Gald to know abt Rachana..I love her creations. Nice to know more about yourself Rachana. Gooseberry Jam looks yummy and tangy. Also, glad to know that you are a self learner. Great to know abt Rachana... never thought abt making Chyawanprash at home... great recipe! Lovely to know more about Rachana whose blog I follow religiously! Love the gooseberry recipe she has presented.